The Federal Government investigation has cleared Chief of Army Staff (COAS), Lt. General Tukur Buratai of corruption in the alleged ownership of assets in Dubai and military acquisitions, it was gathered on Tuesday. PR-Nigeria, a consultant for the security sector, in a press release said investigation has shown that the Dubai investments were based on capital market principles of shareholding. While quoting unnamed government sources, PR-Nigeria said the capital market principle that governed the properties in issue, as it was found by investigators, was like having shares in companies instead of wholly owning the properties. 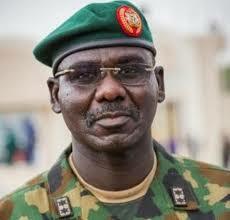 The statement said the government, after investigating a recent media report over the acquisition of property in Dubai, United Arab Emirates (UAE) by General Buratai, discovered that he and his wives invested as "shareholders" like many other persons in the property mentioned in the publications and were not the sole owners. “If you know the properties being referred to, you would know that they are like quoted companies. You buy into them and get dividends as profit from your investments. You can also do your own private findings on this fact,” the PR-Nigeria statement said. An intelligence officer involved in the investigation also confirmed that Buratai declared the assets as required by law.